When I was young, our family wouldÂ go to the U-pick farms and spend two to three hours reaching up into trees and pulling off the most fabulous tasting peaches and apples you have ever eaten. We would pick tomatoes and green beans until your back hurt! There were so many fruits to pick that my dad would go overboard and we would end up with 5 buckets of fruit to take home! My mom would always scold him for picking so much. When we got home, Mom and I would dig right in peeling peaches to put up in quart jars and making batches of peach jam. My children have also gotten to pick fresh vegetables and fruits, either at a U-pick farm or from my own backyard garden. Even though most of my kids have grown and are married, they still come over and “Raid” my pantry for home canned peaches, peach jam, pie filling, tomatoes and anything else that looks good! Every year I give jars of home canned pickles and jams to my family and friends. Every year they dig through their gift baskets looking for those jars! If I stopped making them and giving them I think there would be a family revolt! I’m lucky to have had a mom who taught my how to can and preserve. I hope this gluten free canning primer will inspire YOU to start making your own pickles, jams andÂ preserves for your family and friends to enjoy! To look at the equipment needed, go here. Â Let’s get to it! 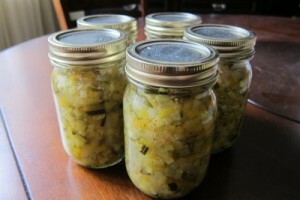 Canning jars: You can find these at any large grocery store. I usually buy mine from church rummage sales. I have found quart and pint jars for 10 cents a piece! I always buy every one they have. When you start canning alot of produce, the jar price can really add up. Lids and Rings: If you buy your jars at rummage sales, you will need to purchase metal lids and rings to go with them. If you bought your jars at the store, they will come with rings and lids in the box. You cannot re-use the lids for another time. New lids have to be used for every batch of preserves that you do. Rings can be reused just like the jars. Canners: You can use any deep stock pot or pressure canner you may have for ” boiling water bath” canning. This method is used for jams, jellies, fruits, preserves, pickles, anything high in acid. You can also purchase a special “Canner” that comes with a rack for the jars. Walmart has a “canner pack” that contains the pot, rack, funnel, and jar lifter all in one box. They are not very expensive to purchase. Pressure Canners are needed if you decide to try your hand at canning vegetables and meats. It is necessary to raise the water temperature above boiling to kill any pathogens that are lurking in your non-acid foods. For beginners, I would stick with the water bath canning first until you get the feel for it and are comfortable in what you are doing. Stock Pot: I use a large non-stick stockpot for all my jams, jellies, ketchup anything that is sticky and tries to stick to the bottom of my pot and burn! You will save yourself alot of heart ache and ruined batches by investing in a good non-stick stock pot! Gadgets: You will need aÂ wide mouthÂ funnel for packing your fruit and jams into the jars, a “jar lifter” to move the filled jars in and out of the canner,Â two kitchenÂ towels specifically for canning (I bought mine at the same church rummage sale), a thin spatula, a lid lifter is handy but not absolutely necessary, a kitchen wash cloth, aÂ ladle, a jelly bag (if youÂ want to make jelly), an apple corer, labels, a good canning instruction book,Â and your dishwasher. The kitchen towels may become stained ( like mine have over the years) which is why it is good to have some just for canning. Â You will also use alot of the things you normally have in your kitchen for regular cooking, like a food processor, knives, chopping board, colander, clip thermometer, measuring cups and spoons, and large spoons for stirring. This isÂ the easiest canning method to learn and follow. YouÂ can makeÂ so many differentÂ things with a boiling water bath canner.Â This method is good for pickles, relishes, jams, jellies, canning fruitÂ to eat, pie filling, juice, tomatoes, marmalade, syrups,Â fruit butters, salsa, pickled vegetables, and probably some other things I haven’t mentioned! Is that enough for you to get started! I hope so! Find a recipe in your canning cook book that you bought and get everything together. It is very important to have all your equipment and food ready all at once. First, IÂ fill my canner and startÂ heating it up because it takesÂ awhile to get to a boil. I then place my already clean canning jars andÂ rings into the dishwasher andÂ push start. I try to heat them up for at least 20 minutes before I use them so they are good and hot when IÂ start filling them. I also place a small pot filled with water on to boil. When the water comes to a boil, turn it off and place your canning lids in the water. Cover the pot with a lid and let it sit until you need them. I then start processing my fruit or pickles and get them ready.Â If I’m canning peaches,Â I will remove the skins and hold them inÂ water that has lemonÂ juice added so they don’t turn brown. I thenÂ make a sugar syrup and heat it up in a large stock pot, place the fruit in and cook for a couple of minutes depending onÂ the recipe directions. Now, my fruit, my canner and my jars are ready all at the same time. I am ready to place my fruit in my jars, cover with the lids and rings,Â gently lowerÂ into the canner and start the timer. While the first batch is bubbling away in my canner, I will peel theÂ fruit for the nextÂ batch and have it ready by the time the firstÂ one is done. Sounds complicated, but it’s just like having batches ofÂ cookies ready to bake one after the other. You get into a rhythm once you’ve done it a few times. I follow this same procedure every time I use my canner for anything! It works very well for me and I have had great success with my canning doing it this way. What happens if you have more fruit than time and you need to finish it up the next day! Leave the water in the canner on your stove. Let it cool down on its own and start it back up again tomorrow when you are ready. I have left the same water in my canner for 4 days during a canning marathon ( my husband can get carried away with fruit picking too)! If you are canning fruit, you can usually leave your fruit outÂ on the counter for a few days before it starts to go on you. Vegetables for pickles really need to be refrigerated when you get home if you are not going to preserveÂ them right away. They loose their crispness pretty quick. All the canning books warn about how you need to get the filled jars in the canner right away or they may crack and break on you! That used to scare me when I read it. After making tons of batches of jars let me tell you, I have not had a jar crack or break on me EVER in all the years I have been doing this. When I am ready to fill my jars, I lay out my kitchen towel next to the stock pot of fruit or jam. I pull out all the jars that will fit into my canner for my first batch and lay them on my cheap kitchen towel. Then, using the ladle, I fill each one to just under the 1/2 inch mark making sure to use the wide mouth funnel. I move on to the next one and fill it until all the jars are filled. Then I clean all the rims with my washcloth, place the lids from my small pot on top of eachÂ jar using the lid lifter ( careful not to touch the white part of the lid with my fingers, don’t want anything getting in) and then screw on the rings. Using the jar lifter, I place each one in the canner where the water is boiling, put on the pot lid and wait until it starts boiling again. The minute it does, I set the timer for the amount needed and start the processÂ all over again. When the timer goes off, turn down the heat, pull the jars outÂ with the jar lifter and place on the other cheap kitchen towel to cool overnight. Do not touch the jars until the next day! You do not want to pop the seal because you handled them too soon. But beware! I have a word of caution for you! Once you start serving your own jams andÂ jellies your family will not let you stop!Â They will taste that bland canned food from the store and reject it! So think long and hard about this before you begin! I started doing this when my children were small and I’m still doing it! I asked my son, when he came over to stealÂ more jars from me, what he was going to do when I couldn’t can things anymore. His reply was that I would just have to teach him how to do itÂ beforeÂ I got to that point! Passing it down to the next generation!